The job role social media manager is among the new jobs that were created along with the explosion of new media. Sometimes it is a confusing job description because some companies that claim to need social media managers don’t really have a full grasp of the job description and the required experience and qualification a social media manager should have. In some cases, social media manager jobs might be reduced to posting pictures on a company’s social media channels. Some brands just want to be on social media for the sake of being on social media, this is why social media is not given the attention it truly deserves thereby making the social media managers very ineffective. However social media management is a complex multi-faceted job role that can help a business to achieve its highest level goals. 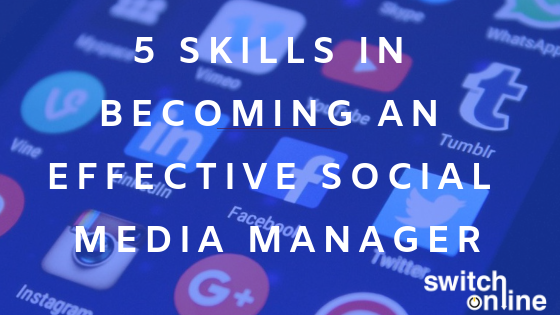 Below are some skills and knowledge that will help an aspiring social media manager to become an effective social media manager. Social media should be part of the communication and public relations (PR) strategy of any company that is any social media platform. The social media manager should be able to communicate effectively using engaging post, images and videos. Stale captions should be avoided at all cost. Some customers come on social media platforms to vent their frustrations, give their feedbacks or post “what is on their mind…lol”. It is the job of the social media manager to escalate these issues to the appropriate department that will effectively handle any pending issues. Any PR disaster on social media can adversely affect a company’s image. A social media manager must maintain every standard of excellence a company is known for, even when his/her client is not largely unknown, the contents across all social media must project excellence. The images must have high quality. There should be no trace of mediocrity and incompetence in the copywriting. Every content going out to any platform should be proofread and vetted. In this era of cyberbullying on social media, excellent customer service is a must in social media management. Some social media managers are drawn into rants and clap-backs on social media channels like Twitter. Professional conduct is expected from every social media manager. Customer service skills like empathy, building rapport, active listening must be acquired. Skills on how to handle abusive, angry, difficult and unhappy customers must be developed by social media managers. Social media platform is very useful in inbound marketing. A social media manager should understand the correlation between social media advertising, content marketing and Search Engine Optimization (SEO). Social media advertising doesn’t work in isolation, it is part of the whole digital marketing strategy. Some followers can view your posts on Facebook or Twitter and immediately search you up on Google. It is imperative that your social media posts should be in consonance with your contents on a brand’s site and the content distribution strategy. Social media channels display basics like the number of likes, comments, shares, retweets and impressions. For examples, Facebook gives some analytics on demographics and behaviours. These analytics helps a social media manager to know the posts that can resonate with the audience. The inability to use analytics makes a social media manager to create contents that will not connect with the brand’s followers of social media channels.